Cobalt allergy affects about 5% of the population. Indeed, Cobalt is present in the composition of many everyday items: in beauty products such as make-up, hair dyes, blue and green shaded clothes, and tattoos. Cobalt is also found in our diet (vitamin B12), in antiperspirant deodorants, in dental and orthopedic prosthesis, in detergents, in plastics, and in alloys containing also Nickel. Skintifique has developed the world’s first products that actively protect skin from Cobalt. They are based on an exclusive patented technology, Capturifique, which captures metals at the surface of the skin and prevents them from entering it. Protects skin from Cobalt and metals for up to 14h. Moisturizes intensely. Cleanses softly. Proven efficacy. Very safe & pure formulations. Unique protection against metals for up to 14h. Let’s the skin breathe. Proven efficacy. Safe & pure formulation. 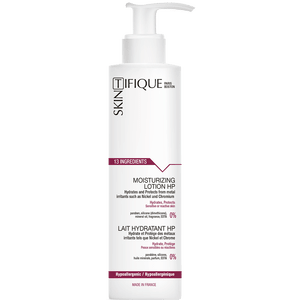 Protective moisturizer: protects skin from Cobalt and metals. Proven efficacy. For body and/or face. Safe & pure formulation. 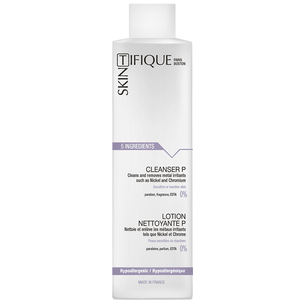 Gentle cleansing and purifying micellar water, makeup remover. Removes impurities and traces of Cobalt and metals.